Hey all. I took Zeus to the vet last Tuesday for a followup on the hair loss around his neck and belly area. The vet said it looked like his hair was trying to grow back, but the progress was going slowly. So she upped his Prednisone to 20mg a day (it was 10mg previously, and then gradually less after a week) and we recheck in a month's time. He's scratching less frequently than before. The vet hadn't said we needed put anything on the area... but every once in a while I'll put Band Aid's Hurt Free Antiseptic Pain Relieving liquid on it if it turns red because he was scratching. Ive attached a picture below of his progeess. The first oic was thd worst that it was. That was the day we woke up to the constant sound of him scratching and when I checked him his poor neck was raw Called the vet immediately to bump his appointment up. Weight Issue: When we took him to the vet that day, he weighed 74lbs. On his recheck, he weighed 71. Last night when I was petting him, I noticed that his spine felt and looked more noticable... I had asked the vet about his weight loss and she asked abiut his food. We had been and are now finished transitioning him from TOTW to Purina Pro Plan Sensitive Skin and Stomach, Salmon and Rice formula (geeze, whats the acronym for that one?? ), and she told us to check the kcal count per cup, and compared to what he was eating, each cup has a higher kcal count...so he's getting more than before! His new plan's bag says to feed him less than what he was, but I'm pretty sure if we use the recommendations he'd look like a skeleton. We're actually wanting to feed him half a cup more because of his protruding spine. He's already getting 4 cups a day. The vet said his meds would have an effect on his appetite ... could that be why he lost weight in those 2 weeks? Gas: I've made fun of it before, but Zeus's gas has gotten really bad. I had to put his bed in the hallway last night becauae we couldnt take his gasiness in the bedroom! Is it his age? The breed? Yes, we have changed his food but he was gassy like this while on TOTW. It's just gotten worse over thr past month. Any help regarding this would be appreciated. We have candles in every room because of him! Last edited by gamermouse0213; 03-29-2019 at 09:31 PM. I’d definitely be at a veterinary dermatologist with this. General practitioners just aren’t good at treating chronic skin issues. I’d also get a thyroid panel done immediately and sent OUT TO MICHIGAN STATE for accurate results. The extreme gas is extremely uncomfortable for your dog and is a HUGE symptom that should not be ignored! Prednisone is a bandaid and can actually allow serious infections to get going because of immune system suppression. If prednisone doesn’t help the body heal itself quickly, it’s very unlikely that continued use is going to change anything- most importantly, prednisone does not identify or address the root cause of the problem. You need to find out what that is. This seems like a food allergy to me. In humans food intolerances/allergies are liked to stomach issues and eczema. 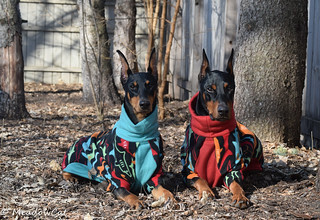 My daughter is allergic to milk and I am almost sure is sensitive to gluten also.....she suffers the same problems as your Dobie, extremely itchy eczema that she grates at with her nails, wind and bloating! The biology is transferable between species. Perhaps a dog nutritionist could help? Just wanted to add that his weight loss could be due to intolerances/food allergies also. A good dermatologist will pursue the source of the problems and will definitely evaluate for allergies. 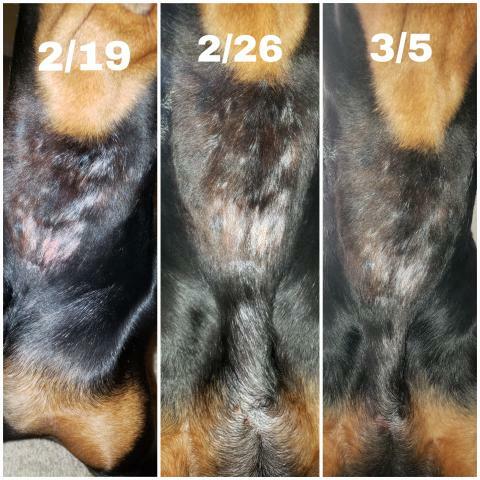 In addition to a dermatologist, you might also seek out a holistic vet - my girl had horrible itching and nasty skin issues for a couple of years, and the regular vet just cycled her through steroids and antibiotics. :-( Changed her diet to raw, which made no difference. Chinese herbs and accupuncture. Probiotics for gas. The difference is amazing. Her immune system is in way better shape and her coat and skin look amazing. No more staph infections. But for her, the game changer was Apoquel. It was the only thing that stopped the scratching-all-day-long. We are now down to one dose every other day. But, every dog is different! Highly recommend a vet dermatologist they deal with skin issues on a daily basis. Hope you get things figured out soon..........Dematologist....I had to take Hoss to one for a few visits. Hoss was in tip top shape in no time. They always seems to know whats in season in your particular area........great speciality. You might seek out a university veterinary hospital where they have multiple specialists who can work together - dermatology, internists, etc, to see what's going on with him. Don't waste anymore time on a regular practice vet. They don't spend THAT much time on skin issues in vet school. Get to a specialist. If you have a vet school nearby, utilize that resource. You will also have access to other specialists right there. IF and I say IF, you can get your regular blood work cheaper at your vet, do it. If not use the school. This sounds like allergy issues and you will do better with a specialist. Good Luck. Skin issues are so hard to pinpoint definitive diagnosis. We're having similar problems with both patchy fur, itching, and gas, so it's comforting to know I'm not alone. Any recommendations on how to find a reputable dermatologist in my area? I can just search around me, but if I'm going to shell out for a specialist, I'd love to know that they're good. Sorry to hear. I am a retired Vet Tech. Usually Prednisone increases appetite. I don’t know what they have all done. A complete profle and CBC are warranted along with a T4. Skin scraping and biopsy of site if scraping is normal. Also check surface for bacteria or yeast, although it does not look like that. Hypothyroidism usually presents as bilateral hair loss without the intense itching. In all fairness, true food allergies are actually pretty rare. Instead of prednisone we liked to use Apoquel. Long term pred use is not good. If you are not satisfied with your Vet, ask for a referral to a dermatologist. I’m am glad to hear you switched food to PPPSSS, because of DCM. Good luck to you. Gamer - I have a question Did Zeus have this problem when you lived in Texas ? I wondering if moving to ? where is it dang it ? New Mexico ? if this is when the problem started - Maybe stress of the move , Maybe the different kind of grass ? The pollen from the grass or trees ? Comet brings up a good point about Prednisone - Not good to keep them on this for a prolong time - and it will cause there appetite to increase - I don't understand why your Vet would say it would decrease ????? IF - it is a allergy - it may be just a prosses of elimination - like food - what you wash his blankets in - it could be anything - In the spring - I really have to try and keep Ali's paws washed when she goes out - to keep the pollen off - if she licks here paws then it get's into her system . ....Comet brings up a good point about Prednisone - Not good to keep them on this for a prolong time - and it will cause there appetite to increase - I don't understand why your Vet would say it would decrease ????? Maybe he's thinking in the short term? Because some dogs do get a little nauseated, even vomit-ey, at first. But yeah, you'll definitely get an increase in both appetite and thirst on Prednisone. Sorry! I don't think I was clear. The vet said that the Prednisone would effect his appetite in a way that'd make him hungrier. So what I meant was that I don't understand why a dog who is hungrier and eating up all of his food and wanting more is losing weight. We had another vet visit yesterday because Zeus suddenly developed a huge lump on his back out of the blue. It freaked the heck out of me, so we went to the vet immediately. Turned out to be an abscess, and now he's on an antibiotic called Clindamycin and a Purina ProPlan probiotic supplement because his stools, although not diarrhea, have been really soft and she didn't want the new meds to mess with his stools/digestion. He's up to 71lbs now, although that's still 3lbs lighter than what he was on the 19th of February. We're upping his food to 6 cups a day (3cups in the morning, 3 in the afternoon, per vet's orders). @ECIN , he didn't have as many symptoms in Texas. The only thing he really had a problem with was the irritation on his neck area. Now, he's starting to lick his paws a lot, which we brought up to the vet. She said he may have an environmental allergy and suggested we try wiping down his paws when he comes in from outside. I've got to do a lot better with that because he goes outside A LOT now due to the Prednisone. He urinates super often. When you wipe your dog's paws down, do you just use water and a rag or do you use special pet wipes to do so? I asked about possible food allergies, and she said that in order to properly diagnose that he'd have to eat a special food for about 3 months, no treats or anything other than the food, and monitor how he does. I'm game to do anything to help my buddy, but she wanted a stool sample to check for any possible internal parasites. I should be getting a call with those results either tomorrow or Monday. I'm going to bring it up again with his regular vet. This one was a random vet since we were a walk in. Last thing, I promise. I gave Zeus a bath on...Tuuuesday (maybe Wednesday) because I thought maybe it'd help with his itchiness AND he hadn't had a bath since....maybe...November? All natural shampoo and conditioner. But I've noticed now that he's super dandruffy. It's way dryer here in NM than in TX so I'm thinking that may be the issue. I got organic coconut oil to hopefully combat his dry skin, but I'm not sure if I should rub it on him every day or once a week or what. Any advice on that? And he licks it off immediately after (or as) I'm putting it on, so I'm not even sure how much is getting and staying on his fur! I'm going to try giving him a little to eat (1/4 tsp to start out with). I also want to add Omega 3 supplements to help out with his skin. So much with this guy! lol. He's lucky I love him to pieces! Also I washed his bedding today. The last time I did so was about 3 weeks ago. I should probably just wash his stuff on my weekly laundry day. Having been through some of what you're describing with my allergic dog (very similar symptoms, and repeated visits to his general practitioner with limited success), I REALLY recommend that you take him to a specialist dermatologist/allergist. At the very least, that doctor can help you decide if an allergy is contributing to Zeus' skin problems, pinpoint what the offending allergen may be and help you come up with a treatment plan. If Zeus does have allergies, various shampoos and oils are not likely to "cure" his skin problems and could even make them worse. Prednisone is really best used for the short term; the longer a dog is on it, the more chance he has of developing serious side effects. It works by suppressing the immune system, so it can actually make a dog more susceptible to the development or worsening of skin infections. Prednisone (or prednisolone) may provide a jumpstart to getting your dog's itchiness and skin inflammation under control, but he will likely need a different plan for long-term management of his skin problems. I'd visit a dermatologist at least for testing and to set up a game plan for his treatment; it is possible that your general vet may be able to manage a lot of his treatment from there on by consulting with the specialist and following his recommendations. A combination of allergy shots and the medication Apoquel; coupled with antihistamines, steroids and/or antibiotics as necessary for flareups, was our treatment plan for Kip. He went in to see his dermatologist about every 2-3 months for a check-up and continued to see his general vet for ordinary things like annual physicals, routine bloodwork and shots. As someone has already said, environmental allergies are much more common in dogs than true allergies to foods. Unfortunately, they are also more difficult to deal with...it's easier to stop feeding a problem food than it is to get rid of pollens, molds, dust mites, etc that are around us everywhere. Skin problems can be a bear to diagnose and to treat effectively. Last edited by melbrod; 03-17-2019 at 01:18 AM. Gamer - To answer your question - I just used water and a towel - Here's what I have found and many may disagree with me here - But I found it dang near Impossible to keep her paws clean from being out doors - then add to the fact that not only her -- being outside tracking it in on her paws - but we do to - with our shoes . We have a big patio made of stamped concrete - I found that using the hose and washing it off in the morning and evening - may have - helped a little - by keeping us from tracking in pollen - If Zeus is licking his paws - I say you have found your problem - Watch him - We had one girl that would start out licking her paws then it got to the point she would chew on her pads till they bleed = raw pads - she could do this of minutes . The only thing we found to help her was a shot of Pred. it would last ? maybe 2 weeks or so and that would get her past peak pollination time here . Vet also said it could be from the grass - trees - anything that pollenates . We really didn't want her on Pred - Yet it was that or raw paws and her being in discomfort . I am with the others with there very good advice : It maybe be time to go to a Vet in a higher pay grade to see exactly what is bugging our buddy Zeus ! A dermatologist is definitely in our near future. Thanks everyone! Definitely heeding all of the advice. I'll keep you posted. Good luck! I hope you get to the bottom of this and find a treatment that works for Zeus.